Published: Sept. 10th, 2013 by Little, Brown & Co.
"A brilliant literary debut, inspired by a true story: the final days of a young woman accused of murder in Iceland in 1829. This story tells a fictitious version of the tale of Agnes Magnúsdóttir, the last person to be executed in Iceland. Here, we read the story of her past and her present, and how the two merged into her future of execution. Has justice been served, or is this all just a huge misunderstanding? This book will make you think twice about accusations and punishments, and how society views outweigh the view of truth. In all, it is a beautifully written story that had me in tears at the end. This book started off a bit slow, and lagged a bit in the middle, but as the subject matter was interesting, I kept reading because I just wanted to get to know Agnes more, as well as what happened and how the murders came to happen. After all that happened in the book, I had forgotten that she (as mentioned in the synopsis) was the last person to be executed in Iceland, but I kept rooting for justice and that she could get spared. With this book, you get an idea of Iceland in that era, including how the government worked, how day to day life was, as well as great descriptions of the scenery and environment. 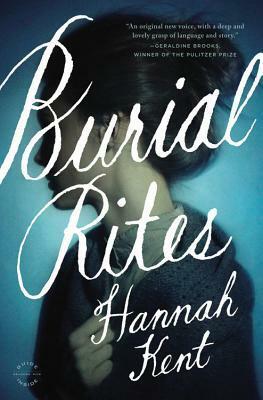 Hannah Kent’s writing is not only descriptive and somber, but beautiful and poetic as well. The symbology of birds (freedom,) more specifically ravens were noted as they brought on foreshadowing. How those blind to injustice misconstrued the collective noun for a flock of ravens to mean A Conspiracy, when those who were willing to listen recalled that it’s actually An Unkindness says a lot about how Agnes was seen in her company’s eyes. The author does a great job of really plopping the audience down in the middle of this historical setting and guiding our eyes and ears throughout. I like how the characters attitudes have changed throughout the book towards Agnes. Once she finally showed her true character (a hard working woman) and shared her version of events, she was seen in a different light, but because the people in power did not want to see this light, it was extinguished. This is a moving story that I would recommend if you love historical fiction with intrigue and great, although emotional, backstory. This is a story of faith, love, hardships and injustice. This is the story of Agnes.